Alejandro Arteaga of Ecuadorian ecotourism company Tropical Herping needed just one more lizard to complete his book The Amphibians and Reptiles of Mindo. After searching for 3 years, his team of researchers and photographers found the Pinocchio anole (Anolis proboscis) clinging to a branch above a stream in a section of pristine cloud forest north of Quito. The elusive lizard, discovered in 1953, went missing completely between the 1960s and 2005 and this is only the 3rd one seen since that time. The specimen is a male, as indicated by its headgear – a sexually selected trait that indicates to females that it has good genes. 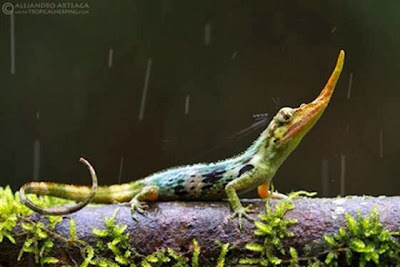 The team kept the lizard only overnight, so that it could be photographed in daylight when its colors had brightened, then released it back into the forest. Says Arteaga, "After looking for so long ... It was very thrilling to find this strange lizard."